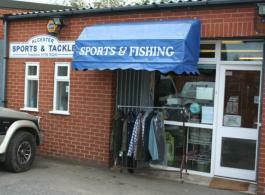 Here on the edge of Alcester you will find a wide variety of goods to suit many sports. From clothing to foot wear. Protective gear to balls and equipment, to suit both the keen enthusiast or those looking to take up a new sport. For help and friendly advice look no further. Please telephone to check our stock. If you are looking for something not listed please do not hesitate to telephone as it simply is not practical to list every item we stock. In addition to stocked items we carry many catalogues from which we can order items for you. Wilmcote Air Rifle Team are looking to recruit new members under 16's welcome (but you will have to be accompanied by an adult). For more information. Directions and map in more detail. "Where you are assured of a friendly personal service"
Here on the edge of Alcester you will find a wide variety of fishing tackle and clothing to suit the serious match angler, enthusiastic amateur or anyone just becoming interested in fishing. Air guns including rifles, pistols and pellets.